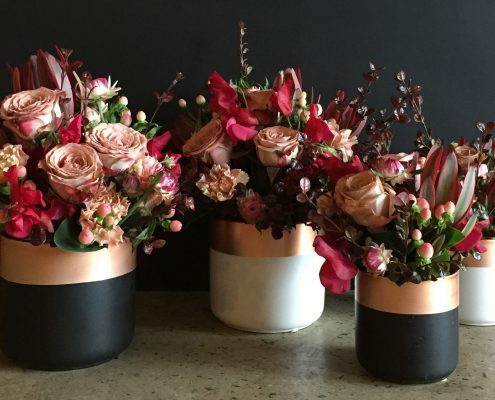 Geelong Flower Farm has the largest flower selection in Victoria and offers a friendly and professional service to the general public and the industry 365 days a year. The farm boasts a huge cool-room and retail floor full of unusual varieties of quality fresh and native flowers – where you are sure to find your favourite! We also stock a great range of different and stunning glassware and pots, as well as a wide range of beautiful Ecoya diffusers and candles for the perfect gift. Geelong Flower Farm stocks the largest variety of fresh cut flowers in the western district – so the list is simply too long to mention each and every one! We stock many all-year-round varieties as well as all seasonal flowers sourcing them from Greater Victoria and beyond. We also have seasonal pot plant varieties throughout the year. If you would like to hear about a particular variety or type of flower, please don’t hesitate to email or call for more information. Our range of clear, coloured unique glassware and vases are very reasonably priced. With a range of many different shapes, designs, lengths and sizes, you are sure to find the one perfect for your home or as a gift! We also have vases available for hire for your next function or wedding at a fraction of the retail price! We have a small range of giftware which includes pots and ceramics and the gorgeous scents of the Ecoya candle and diffusers range. At Geelong Flower Farm we stock everything that any florist or flower enthusiast needs. We have all the essentials including floristry tape, wire, rose strippers, gloves, clippers and much more. We also stock a huge range of Oasis foam products which include blocks, spheres, wreaths, cages and much more. Why Choose Geelong Flower Farm?